The Series C funding will support a service expansion beyond major metro areas and support for new products. Digital pharmacy Alto today announced the closure of its $50 million Series C funding round. The investment was led by Zola Global and Greenoaks Capital, with additional participation from Jackson Square Ventures, Olive Tree Capital and other unnamed investors. According to the company, the latest funding will help the company push its tech-driven prescription delivery service to new regions within the US, as well as expand its product line for chronic and complex conditions. 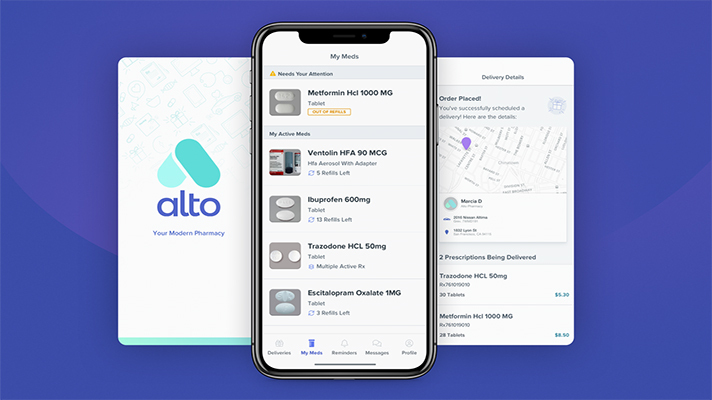 Along with free, same-day medication deliveries, Alto’s service features a patient app that helps users order and refill their prescriptions, understand costs, speak to a pharmacist on demand and coordinate care with their provider or insurer. To support this, the company also sells pharmacy management software and a provider platform that facilitates prior authorizations, insurance coordination and improved patient monitoring. So far, Alto has enjoyed partnerships with UCSF, Stanford, One Medical and others, with its platforms having impacted the care of more than 50,000 Californian patients, according to a statement. Its delivery services are, however, currently limited to the San Francisco and Southern California areas. According to the announcement, the latest funding will help the company push its tech-driven prescription delivery service to patients living beyond its initial major metro areas, as well as expand its product line for chronic and complex conditions. On the surface, all signs seem to be pointing to the growth of digital pharmacies such as Alto’s. This year alone saw substantial funding rounds for New York City-based online pharmacy and delivery service Capsule and the Chinese online pharmacy retailer Jianke Pharmaceutical. Meanwhile, Amazon made a major entry into the market with its June acquisition of virtual pharmacy PillPack in a deal rumored to fall just shy of $1 billion.